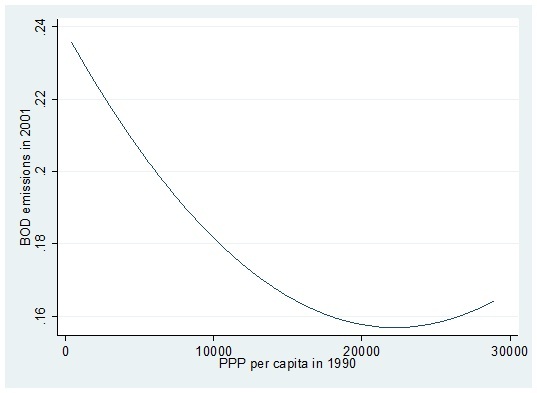 An inverted environmental Kuznets curve? The so-called environmental Kuznets curve (named after economist Simon Kuznets) is based on a hypothesis that environmental quality and economic development are related in such a way that their relationship produces an inverted-U curve. Supposedly, countries with lower levels of income emit low levels of pollutants. When they industrialize and become richer their emissions will increase up to a certain point when countries either start to invest in the environment or switch to less resource intensive means of production, which leads to falling emissions. In a graph where emissions are plotted on the vertical axis and economic development (usually income per capita) is plotted on the horizontal axis, this would lead to a curve resembling an inverted U. The empirical evidence for the existence of such a curve is mixed. Richard Carson finds that it is in fact effective regulation and diffusion of technological change that cause environmental quality to go up, and that these two factors are associated with higher income levels. If Carson is correct, it would imply that the underlying reasons behind an environmental Kuznets curve are all but clear. A very simple empirical test also casts doubts on the existence of such a curve. For this test all data available in the World Bank’s database – in total for 68 countries – was used to estimate the relationship between so-called biochemical oxygen demand (BOD), and income per capita (in purchasing power parities (PPP) and constant international dollars). BOD refers to the amount of oxygen that bacteria in water will consume in breaking down waste. This is a standard water-treatment test for the presence of organic pollutants. BOD satisfies both the condition of being a local pollutant and of having short-term costs – two conditions normally claimed to be required for an environmental Kuznets curve to exist. It should be noted as a significant caveat that data on both BOD and PPP are sketchy, but this test at least suggests that BOD falls sharply with higher levels of income per capita until a certain point when BOD starts rising again. It could be something worth looking into further.